Being prepared for the camping or hiking trip you’re planning to take involves a taking a lot of items along. Sadly, we can’t carry with us an entire shed worth of tools, but that’s why shortcuts such as a survival wristband were invented. With the help of such wearables, you can have not only a sturdy cord with you, but also a few key tools tucked inside. The marketplace offers variety, of course, but it can also be a tad confusing. 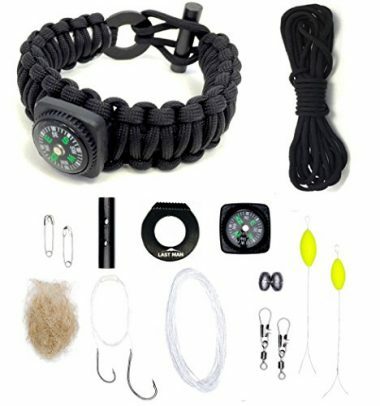 That’s why we’ve put together this top of the best paracord survival bracelets to choose from, as well as tips on what features to look for before the final buy. So, without further ado, here are Globo Surf’s top-rated picks. A classic emergency bracelet with the basic need tools included into it, this Atomic Bear pack of two bracelets can be a wonderful gift for you and a loved one, or for a pair of friends. What could be a nicer way to wish someone well than giving them a few items they could need in an emergency situation? That being said, the price of this survival wristband is among the best things about it. Considering how affordable it is and the tools it includes, it’s kind of the best bag for your buck. Still, you can’t expect it to have some of the fancier features of the heavier priced ultimate survival bracelets. 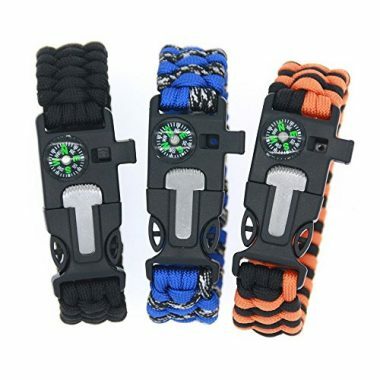 An emergency bracelet that looks and feels quite high-tech, the X-Plore Gear survival wristband is very popular among camping and fishing enthusiasts. It is deemed to have a smart design that makes it easier to store and carry, which means you can wear it not just on your wrist, but also snap it on your backpack. This way you can have it nearby at all times while on a camping trip. It contains a fire starter and flint, compass, mini scraper, whistle and the paracord, making it one of the best paracord survival bracelets available. It is also waterproof and can be used to set traps (instructions are available from the manufacturer). 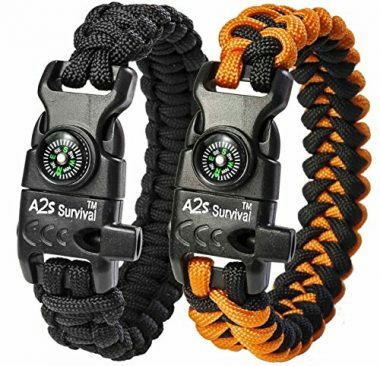 One of the ultimate survival bracelets and yet surprisingly affordable, the A2S Protection bracelet offers everything you will need to survive in the wild. The cord has been tested to hold up to 550 lbs without breaking, which makes it an ideal mens paracord bracelet. Also, the 12 feet of military-grade paracord can also be picked into the 7 individual strands that make up the cord. These finer strands can be used as fishing line, sewing strings or fire tinder; amazing, right? 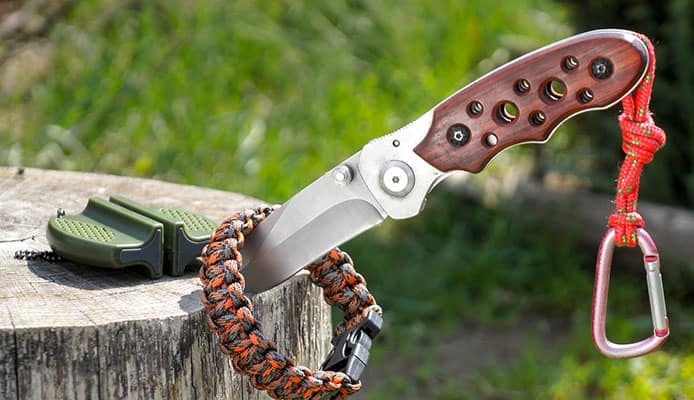 Of course, in addition to this versatile string, the paracord bracelet includes the fire starter, the compass and the mini knife / scraper you should expect. With this new entry on our list of the best paracord survival bracelets, we are heading into the realm of top-quality patented items. 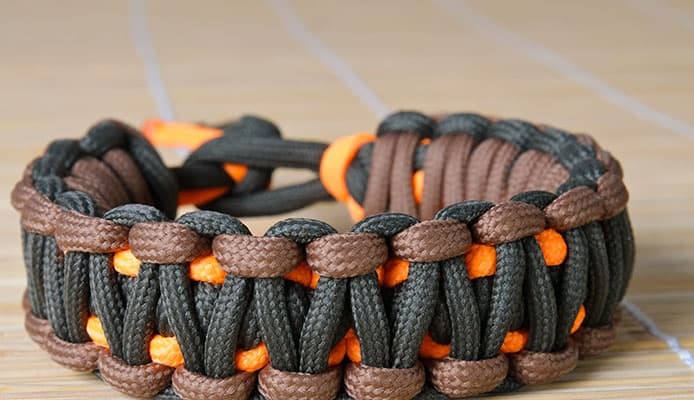 This survival bracelet is made from over 11 feet of this highly durable cord and can be used in a variety of situations which may occur in the wild. The quality is guaranteed to last a lifetime and Titan will replace your bracelet or refund it at any time. The SurvivorCord nylon string in this emergency bracelet is recommended to be part of any emergency kit or survival backpack. Most survival bracelet reviews written by serious preppers swear by it. The only downside? It doesn’t include the mini-tools contained by the others, but no one is stopping you from creating your own kit using this fantastic cord. Besides all the mini-tools we’ve seen at the other top-rated paracord survival bracelets, this one also contains a thermometer. It’s the best survival bracelet for mountaineering and all sorts of outdoors adventures, especially for people who are used to wearing a watch. Since it would be uncomfortable to wear both a watch and a survival wristband, why not combine them into one item? 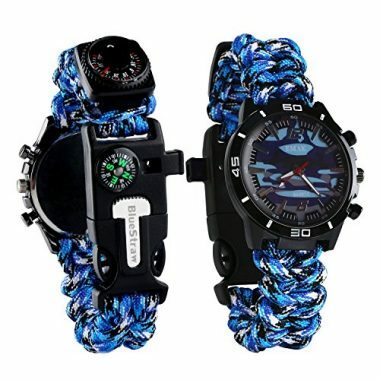 Note that although the paracord bracelet is labeled as waterproof, this doesn’t extend to the watch, but only to the top-notch survival cord and the tools. If you get soaked, the watch will probably stop functioning. 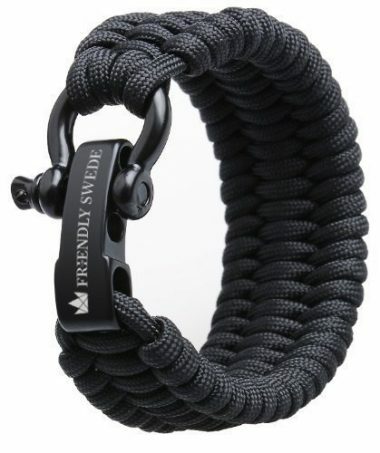 Another emergency bracelet coming from a cult brand in the preppers’ world, this survival wristband has one of the best cords you can find. It doesn’t include so many mini-tools, but it’s meant to be included in a kit that contains them separately. What does make it the best survival bracelet for a hiking or camping trip is its ultra-resistant rope, the steel shackle and extra pin. If the need arises, it will unravel and get you out of any tight spot. Another emergency bracelet that doesn’t come with mini-tools, but only with the high-grade cord and a D-shackle, this item has the advantage of providing you with an adjustable shackle. This can become extra useful in hiking or in situations when you need to lift or carry various heavy objects. Also, the same shackle can be used to start a fire (with the bow pin technique, described in the instructions leaflet). A high-end survival wristband, this item from Last Man is hugely popular with those who take prepping for emergencies seriously. Inside the carefully woven paracord survival bracelet a kit of 16 emergency items is contained. Among the ultimate survival bracelets, none are so complete as this sturdy little gem. You’ll get the following mini items inside: the cord itself, kale hooks, line swivels, a test fishing line, foam bobbers, egg sinkers, fire starter rod, fire striker, tinder bundle, safety pins, and a compass. A simple but reliable emergency bracelet, it comes with the basic tools to except from this type of model. The survival wristband includes a fire starter and scraper, a loud whistle that can be heard from miles away, and a waterproof compass. The paracord dissembles into 12 feet, and the rope itself is treated to be resistant to ageing, corrosives and friction. For a basic camping trip, it’s all you’ll ever need. 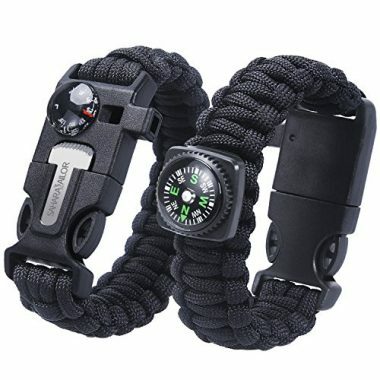 Confused on choosing the best paracord survival bracelet for your needs? We’ve got your covered. Think of what you are planning to use your emergency wristband for, and the situations you are likely to find yourself in. If you’re building a survival kit for home, then think of the most reliable paracord and ignore the tools since you can add them separately. If you want it for a casual camping trip, the most basic tools are enough. If you hiking to high altitudes, maybe think of more reliable rope and shackle. Again, this is a question of the kind of trips you tend to take. If you need it to be super adaptable, don’t look in just at the tools, but also look at the pins and shackles; they should be adaptable too. You need at least 11 feet of cord for your investment to be worth it. Luckily, our top of the best paracord survival bracelets only includes models with this minimum length of rope. If you don’t venture too deeply into the wild, you won’t need that many extra tools to be included. Or you could opt to take them along separately and just focus on the cord when choosing the best paracord survival bracelet for your trip. It all depends on your adventure plans. 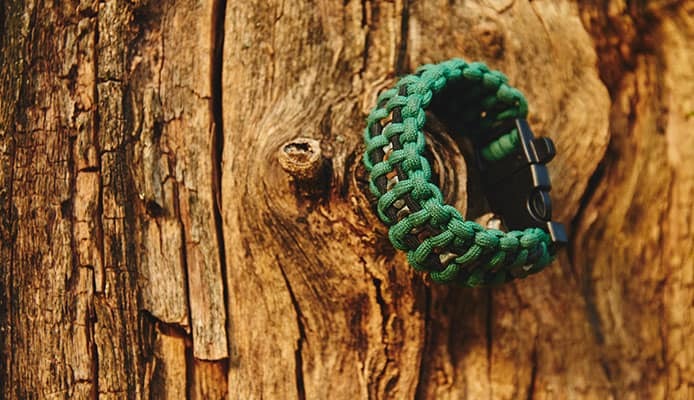 Ideally, you need a paracord survival bracelet that can be worn on your wrist but also hung from your backpack or other gear. Also, the clasping mechanism should be tested for resistance as well. Stainless steel is your best choice. The best kinds of cord are patented and tend to be more expensive, but it’s worth it, especially if you want your emergency bracelet to have a long shelf life. Your cord should be time-proof and corrosives proof to be reliable even after a few years. If you know your wrist size is outside the majority’s, look for the extra adaptable sizes. There are several in our list above which can satisfy this need. Color is, of course, mostly a matter of preferences, so feel free to pick your fave. However, if you are venturing into a dangerous area, maybe it’s a good idea to pick a strong color that can be seen more easily from a distance. 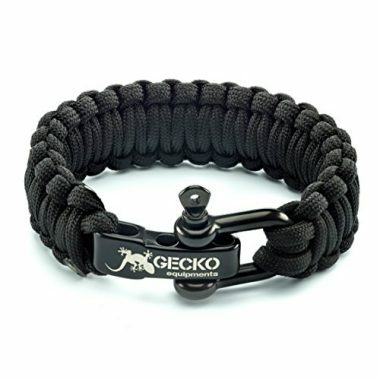 Q: What Is A Paracord Survival Bracelet? A: A paracord survival bracelet is an accessory woven from parachute cord, which unravels into a strong 11-12 feet of rope if you need it. Some models include extra tools needed for survival in addition to the paracord rope. 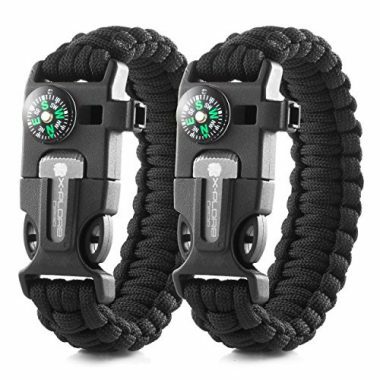 Q: Do I Need A Paracord Survival Bracelet? A: You will probably not need it until you do, and then what? It’s best to go on any outdoors expedition prepared, and the survival bracelet does just that. It provides you with tools to hang in there until help arrives, should things go awry. Q: What Are Survival Paracord Bracelets Used For? A: In case of emergency, the best paracord survival bracelets can be used for an entire host of tasks related to surviving in the wild. From getting a fire going to scaring off animals or creating shelter to finding your way back home. Q: How To Deploy The Bracelet In Case Of An Emergency? A: Each model comes with unique instructions on how to deploy it, so it’s best if you simply check the leaflet. However, it should be fairy simple in all cases, and it involves unraveling a corner of the emergency bracelet and pulling at its rope for everything to come undone. Emergency preparedness means having the tools needed to survive even in the direst circumstances, but wishing for that situation to never come. It’s a matter of finding balance between what you can reasonably expect and what you can reasonably do to be prepared. 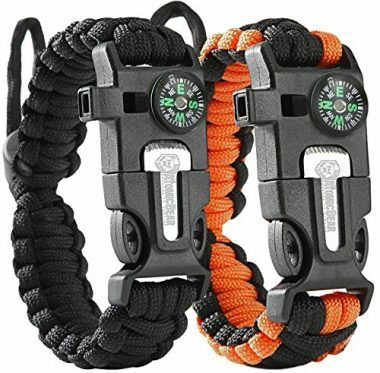 The best paracord survival bracelets give you a head start on beating unfavorable odds while camping or hiking. Paracord Uses for Survival, SkilledSurvival.com. 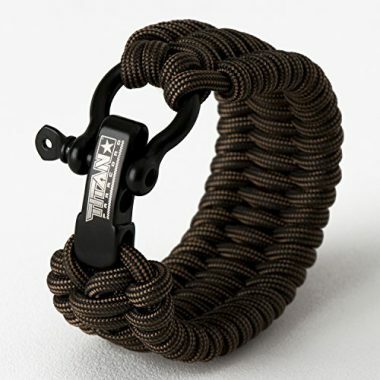 Have you ever used a paracord survival bracelet yourself? Share your camping stories or hiking advice with the other Globo Surf readers in the comment section below!